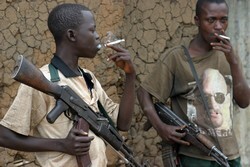 KINSHASA, 19 February 2007 (IRIN) - The recruitment of child soldiers has continued in the Democratic Republic of Congo (DRC), despite the government's efforts to integrate former militia into the army, a local human rights official has said. "Armed groups have even forcibly enlisted demobilised former child soldiers," Murhabazi Namegabe, head of a local non-governmental organisation, the Bureau pour le Volontariat au service de l'Enfance et de la Santé, said in the capital, Kinshasa. According to a coalition of NGOs in South Kivu Province, of which Namegabe's is a member, the recruitment of child soldiers is also continuing in the northeastern district of Ituri and the eastern provinces of North and South Kivu. This finding has been confirmed by the United Nations Mission in the Congo, known as MONUC, the UN Children's Fund (UNICEF) and some international NGOs concerned with child welfare. They have discovered that the armed groups have been trying to pass off the children into the army reintegration process by falsifying ages, MONUC military spokesman Lt-Col Didier Rancher, said. Some have made their way into the army's newly integrated brigades, after the integration of two of dissident army General Laurent Nkunda's loyalist brigades with three national army brigades since January. MONUC estimates that 4,500 to 5,000 of Nkunda's troops, according to his figures, are due to be combined with a similar number of national army troops. Andrew Zadel, information officer of the UN Office for the Coordination of Humanitarian Affairs (OCHA), said: "The integrated brigades contain 257 children, namely 85 with Alpha Brigade, 95 with the Bravo Brigade and 77 with the Charlie Brigade. These figures are based on estimates by inspectors at the time the records were taken and not from official documents. Moreover, the figure for the Bravo Brigade included 35 children and an estimate of 60 for a battalion that they could not check." The UNICEF communications officer in Goma, Justin Morel, said: "These are just estimates. It is a military secret. No one, other than the military brass, knows the true figure." He said the children were discovered by child protection agents who had actually seen them because they had no identification when they turned up for the army brigade integration process. "Armed groups asked their underage soldiers who have been in their ranks to increase their ages so that they could be recruited as soldiers in the integrated regular army brigades," Namegabe said. According to MONUC, an understanding was reached with the authorities of these brigades for correct identification that would not be based on documents of children but on their real ages. Besides these children found in the ranks of the newly integrated brigades, child protection agents have also denounced the recruitment of children in villages by other armed groups hostile to the army integration process. Among these groups are the 'Rasta', 'Mundundu 40' and various branches of the Mai-Mai militia. An OCHA mission last week visited the village of Gungu, in North Kivu Province, gathering testimonies from villagers who said armed groups had continued to seize their children. "The case of a young person who shot at his friend because he refused to join the troops of Nkunda was confirmed by several people," Zadel said.